Driving while under the influence of alcohol and drugs is a crime that is not taken lightly nationwide. In California, however, one could be faced with two separate misdemeanor offenses for one incident. State motorists can acquire a conviction for merely driving with any alcohol in their system, and be charged yet again if they have a blood alcohol content (BAC) of 0.08 or greater. This statute provides that “it is unlawful for a person who is under the influence of any alcoholic beverage to drive a vehicle.” Even though this law seems simple, there are a few important elements of this offense. Firstly, the phrase “under the influence” simply refers to a person's mental and physical ability to properly operate a vehicle. If a person is impaired to the degree that they can not drive as cautiously or carefully as a sober person, they may be deemed 'under the influence'. It's important to note that just because a person has consumed alcohol, it does not mean they are under the influence. Alcohol tolerance, which is different for everyone, would be a pivotal factor in determining at what point you would be under the influence in accordance to VC 23152(a). If an arrest is made due to an officer's belief that you violated this code, a defendant's fate is heavily dependent on the testimonies of the arresting officer. Observations regarding a defendant's physical appearance, driving patterns and a person's performance on the field sobriety test will most likely be mentioned in testimonials. DUI penalties for the violation of this code are based on whether you have been convicted of your first, second, third or subsequent offense. Usually, one, two, or three DUI arrests constitute as misdemeanors, subsequent offenses within a ten-year span of a prior conviction are classified as felonies. This statute provides that any motorist who has been arrested for driving with a BAC of 0.08 or greater will be charged with a DUI. Drivers under 21 are not permitted to drive with a BAC of .09 or higher, they are also not allowed to carry unsealed beer, liquor or wine in their vehicles while driving alone. Penalties for the violation of this code vary based on the circumstances of one's case. But typically, a first offense carries penalties of four to six months in jail and a fine up to $1,000. A second offense may result in up to a year in jail with a fine up to $1,900. Subsequent offenses are punishable by up to 16 months in jail and a fine up to $18,000. If aggravating factors are present, charges could be elevated to an aggravated DUI, which carries significantly harsher penalties. It's imperative that you remember that an arrest for a DUI does not guarantee a conviction. 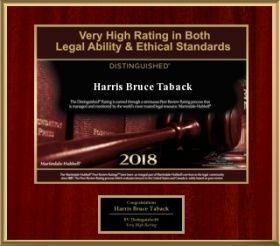 Skilled attorney Harris Taback is dedicated to fighting for your rights. Call his office at (415) 241-1400 or contact him online for a free consultation.